I recently published a paper in EMBO reports (available free online for a few more weeks) which (among other things) looked at the factors influencing the animal rights movement, causing it to wax and wane over time. Antivivisection Organizations (AVOs) are large, established groups who generally pay their staff, like PETA, HSUS or the BUAV. Antivivisection Groups (AVGs) are smaller, more informal groupings of like-minded activists, who might be compensated for time put in, but are unlikely to be salaried. Examples would be Negotiation is Ov er (NIO), For Life on Earth or SHAC. I used Resource Mobilization Theory (RMT; McCarthy & Zald, 1977), as an approach to understanding the antivivisection social movement. Essentially it suggests that success of a new social movement is determined by the resources available to it – these include knowledge, money, media, labor, solidarity and legitimacy. Non-Supporters – People do not actively support the antivivisection movement because they either disagree with it, are unaware of it, or have other priorities competing their time and money. Supporters – People who might donate to an AVG/AVO, attend one of their demos, or otherwise support the movement, but are not employed or core activists within the movement. Activists – People who are either paid by an AVO, or spending a great deal of time working with an AVO. 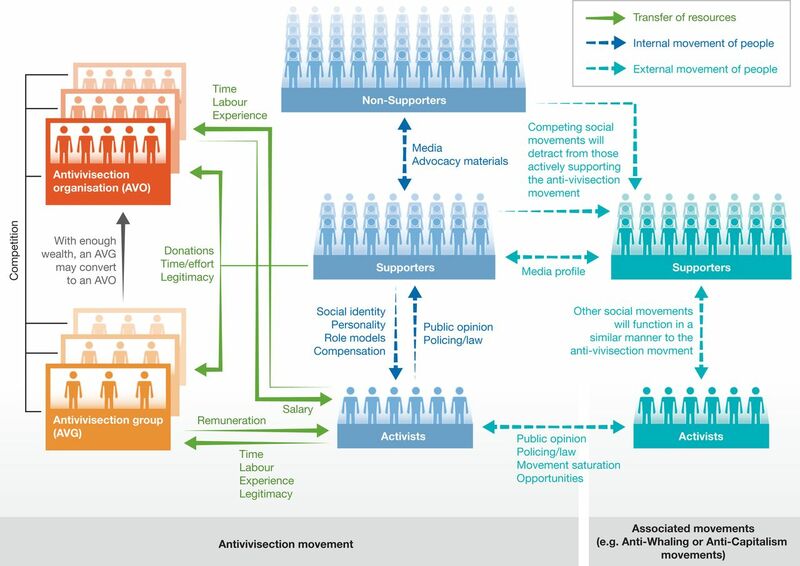 The diagram below (from the EMBO article), outlines the resources which move between supporters/activists and AVO/AVGs, and some of the influencing factors which cause individuals to move into and out of the antivivisection movement. The blue dashed arrows indicate the movement of people within the antivivisection movement: a person might read the website of an AVG and decide to change from non‐supporter (either someone who disagrees with the AV views or has not formed an opinion either way) to a supporter, donating money or spending their time and effort signing petitions. The green arrows denote the movement of resources (e.g. time and money), though it should be noted that these are not exhaustive lists of resources. In return for their time and effort, that person might get a “feel‐good buzz” about helping animals, or from the acceptance of their peers. Later, they might decide to get more involved. This change is the movement from supporter to activist (though the divisions are not clear‐cut). The activist still feels good about what he or she is doing—possibly with a greater social acceptance from their newfound colleagues—and might also find himself or herself remunerated. Note that by giving time or money to any one AVG/AVO, they are choosing not to give those resources to another, so there is a natural competition between these AVGs/AVOs. Years later, the person might find they have less time and will drop back to supporter status, or might find that the massive publicity surrounding an associated movement draws their time and effort (turquoise dashed arrows), such that they stop their involvement with the original AV movement. Such associated movements need not have any relation to animal rights, but the more similar they are to the AV movement, the more competition there will be. Legitimacy is an important resource that both supporters and activists provide. An animal rights group that can only muster 20 supporters at important demonstrations will eventually find its supporters moving to competing AVG/AVOs. When the entire antivivisection movement comes under negative media spotlight, or as laws or police activities make certain activities more difficult, many supporters may move to other associated movements, and many activists may choose to put their expertise into other areas. Animal rights activism is often seen as some sort of fringe movement for young, impressionable idealists, yet in reality it bears a closer resemblance to the professional not-for-profit and charity sectors. As a cause comes under the media spotlight a charity sector can find new resources and expand, with smaller offshoots being formed around the issue, when the media spotlight disappears many of those supporting the cause also move to pastures new. The same is true for the animal rights movement. Animal rights activism is a profession for many involved – selling outrage to a public who lack many of the pertinent facts. Activists move between AVO or AVGs just like charity campaigners move between organisations. Wendy Higgins, Communications Director at Humane Society International has had similar roles at the Dr Hadwen Trust and the British Union for the Abolition for Vivisection. Luke Steele has both founded and joined a multitude of AVGs, most recently the Anti-Vivisection Coalition. The Animal Liberation Press Office has had a whole host of different spokespeople as activists rise and fall. Experience – Established activists know the activists, the media contacts and the techniques necessary to run effective campaigns. In return they may receive financial remuneration or a salary, they also gain from the community to which they now belong, and respect among many of their peers. However, just as activists may flow into a movement, so may they flow out. In the UK, while animal rights activism and extremism was at a high, the UK government founded the National Extremism Tactical Coordination Unit (NETCU) to tackle animal rights extremism. The following year the Serious Organised Crime and Prevention Act (SOCPA, 2005) was approved by parliament, which introduced longer sentences for those conspiring to blackmail research institutions, or interfering with contracts relating to animal research. Injunctions were brought by research facilities against animal rights groups. In 2007, Operation Achilles made 32 arrests across Europe of key animal rights extremists. The result was that many leaders of the antivivisection movement were locked up, depriving a generation of activists of the role models who might persuade them to join the movement. It also made the antivivisection movement a more risky one to join, with fewer opportunities for “successes” (e.g. shutting a lab down). 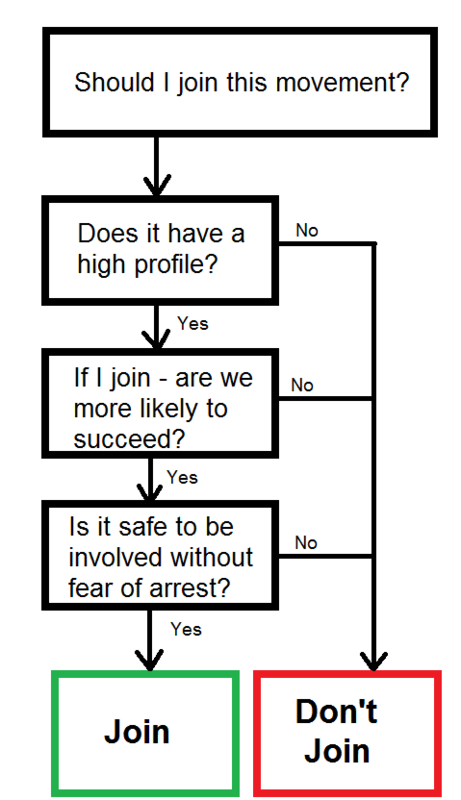 For our young impressionable potential-activist, deciding which cause to throw his time and effort behind, he or she may consider the following questions to themselves about each one. While it may be argued that the AV movement had a high profile in the early-mid 2000s, it was for the wrong reason, with people likely to bring up images of graverobbing and arson attacks. The increasing resilience of the animal research community was also making victories harder to come by (reducing the chance of success), and the police spotlight was also making it less attractive to new potential recruits. Instead our young activist may consider their time better spent challenging rising inequality (e.g. Occupy movements) or fighting against government badger culls (indeed many former antivivisection activists have recently moved to this issue). Diagrammatically (see first image) this can be seen as the teal arrows from supporters and activists to the supporting movements. The professionalism of the AV movement means that competition is rife. AVOs compete to make the biggest stories or infiltrations. This means there is a pressure to make stories more dramatic (and exaggerated) than the previous one. The competition also causes successful tactics to be quickly imitated between organisations. A recent tactic by the Anti-Vivisection Coalition in the UK has been to send a Freedom of Information request (FOI) to universities asking for the number of animals they use in research, and then turning the answer into a press release for local news outlets (e.g. Brighton and Durham). This success quickly caused other animal rights groups to copy, with Animal Aid(vs University of Surrey) and the National Anti-Vivisection Society (NAVS) (vs University of Birmingham) to copy this strategy. The money they are competing for is not small. A quick look at the BUAV’s accounts showed they spent around £200,000 in both 2012 and 2013 on “Investigations” as they attempt to create the biggest stories. The money involved is not small, the three largest AV organsiations in the UK had combined incomes exceeding £5 million and extremist AVG, SHAC, collected over £1 million from street collection tins. Much of the SHAC money ended up supporting full-time activist leaders who were not being salaried by tax-registered official organisations. As such, competition for this cash may be the reason behind some extremism as the pressure to become a leader – willing to risk all for the cause – was the difference between eating well or not at all. This Resource Mobilisation Theory model of animal rights activism only touches the surface of the complexity of this movement. But hopefully helps to explain some of the activities of those within it. To discover more, please read the original article in EMBO Reports (DOI: 10.1002/embr.201438837). Posted on May 13, 2014 May 16, 2014 by EditorPosted in NewsTagged animal rights activists, antivivisecion activists, antivivisection, EMBO reports, NETCU, Resource Mobilization Theory, SHAC, Tom Holder. Nonsense, your competition model is widely disregarded for the reasons I have given, it ignores culture. Your application of the model think does show your intentions to smear anti-vivisectionists, your have have not written an article about how competition has driven pro-vivisectionists. Your choice of language is also telling. You say “This means there is a pressure to make stories more dramatic (and exaggerated) than the previous one.” Note the use of of “make” and “exaggerated”, you could have said there is a pressure on them to report stories that detail animal abuse of greater severity. However the way you phrase it makes it seek like they are merely, as you say, exaggerating. In some ways I wish my competition model was widely disregarded – it would suggest a considerably better readership of the article than is likely the case. The reality is that you have turned your objection into “widely disregarded” – perhaps a case of exaggeration for dramatic effect? Of course it is ad hominem, you are denigrating anti-vivisectionist arguments based on their activists supposedly bad motivations. Your competition model is backed up by nothing more than your own prejudice, it explains nothing. Rather extremism it is a cultural response that some people believe that the violent actions of scientists against animals deserve to be stopped using any means necessary. What those means are are of course again largely defined by our culture. Passionately believing in a cause will then also have an influence in how one becomes an activist. I would also challenge your definition of extremists. One would not consider civil rights activists who break the law using civil disobedience to be extremists. What define extremists then is the use of violence, not breaking the law. – The most extreme violence in campaigns (Save the Newchurch Guinea Pigs, SPEAK, much of SHAC) came after campaigns began to flag and leadership was questioned. Also note that I have not used the competition-theory of extremism to argue against their views. I have stated a belief about their motivations – which is not an ad hominem attack (by your flawed definition of ad hominem, every criminal lawyer who states the motivations of the accused is participating in an ad hominem). While I have agreed culture plays a role, it does not sufficiently explain why some people become extremists and others become activists. The animal rights extremists who were jailed were nearly all involved in violence against people or property. The article reads like a noddy’s guide to sociology. What a gross over simplification, with an attempt to throw in some ad hominem too for good measure. How about the effects of culture, and the passion these people have for the gross injustices committed against animals? The fact that EMBO chose to publish such an amateurish noddy guide to sociology really is an indicator of how poorly scientists understand sociology and philosophy. Second, I don’t deny culture and passion are important, but such an explanation fails to separate activism and extremism. Are the extremists the most passionate? If you love animals more you will take more illegal actions?! No! Competition explains this better.